“Zip-A-Dee-Doo-Dah, Zip-A-Dee-A, my oh my, what a wonderful day,” sings Alice, hurrying along on a perfect summer day in the park. Filling audiences with delight, “Wonderland” is among the children’s programs produced by the Emerald Coast Theatre Company in Miramar Beach. As Alice proceeds on her improbable journey, teens and pre-teens decked out in colorful costumes fill the stage. There’s Tweedle Dee and Tweedle Dum, the Caterpillar, the March Hare, the Mad Hatter, the Queen of Hearts and the mesmerizing Cheshire Cat. This joyful, magical creation, performed on Grand Boulevard, started as a dream of Nathanael Fisher, producing artistic director of the Emerald Coast Theatre Company. With his wife, Anna Fisher, he has launched ECTC, a nonprofit professional company that regularly involves children in its productions, into its sixth season. Having entertained more than 10,700 people in the past year, the Fishers are achieving their goal of enriching and entertaining residents and visitors through professional productions. At the same time, via their Theatre for Young Audiences, they have engaged children who study performing arts, sharpen their communication skills and build their confidence working in a team environment in the educational theater. ECTC is nationally recognized as a regional theatre in the United States. It has gained acceptance into the Theatre Communications Group, which strengthens, nurtures and promotes professional not-for-profit American theatre. With this achievement, ECTC’s name and body of work can be shared across the nation and, by extension, connects ECTC to the global theatre community. “The celebration of artistic talent promotes a larger public understanding and appreciation for theater,” Fisher stressed. The ECTC is thriving, given strong community support and the growing number of tourists who attend shows. The current professional theater season has included comedy, classic tales and favorites such as “The Spitfire Grill,” a heartwarming musical about love, relationships and redemption. 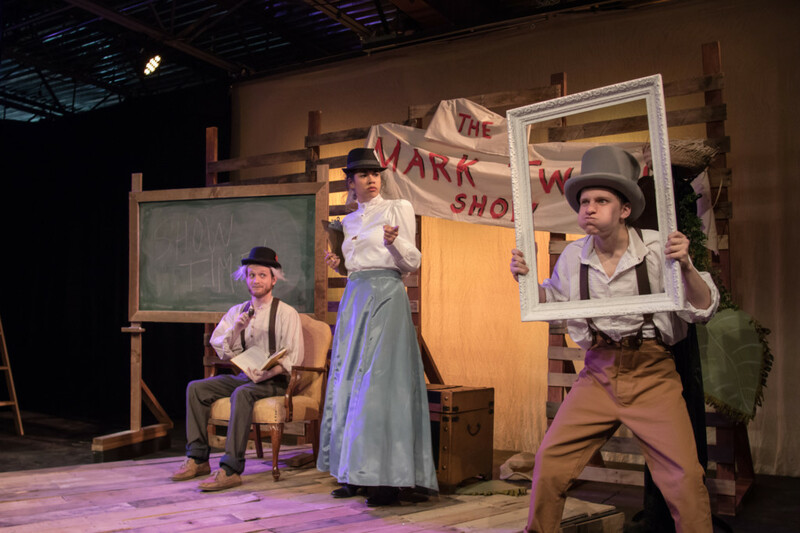 Shows continuing through April include “Bad Dates: Starring Jennifer Steele,” a sweet and sharp comedy about a young woman’s dreadful encounters when she re-enters the dating world and “Around the World in 80 Days,” the Jules Verne classic tale for the whole family. Nearly 500 children are involved with ECTC’s educational programs. Children eagerly attend camps in the summer and weekend practices during the school year. Clara is learning an important life lesson, too. “It doesn’t matter what other people think,” she said. “They will judge you no matter what. Just do what you love.” She credits the theater with giving her more confidence even if she doesn’t always get the role she most wants. ECTC delights in showcasing new and emerging talent. “In a world where women still need to be heard and recognized, we have some amazing female students who have participated in our educational programming,” Fisher said. He selected 13-year-old Soulara Joslin’s original play for inclusion in the Theatre for Young Audiences program. It was later made part of the Northwest Florida Theatre Festival. ECTC’s professional programs and theatre for young audiences have proved to be a smash hit for adults and families, a destination filled with wonder and laughter that keeps people coming back for more. Emerald Coast Theatre Company: All professional shows are performed Thursday through Saturday at 7:30 p.m. and on Sunday at 2 p.m. For more information on classes for young adults or to purchase tickets or subscriptions, visit EmeraldCoastTheatre.org or call (850) 684-0323.